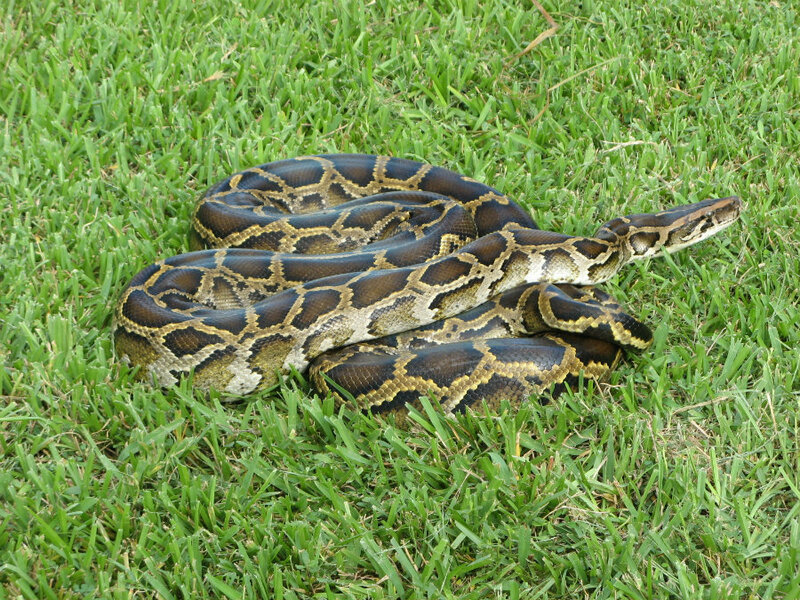 Florida- Researchers in the look for Burmese pythons in Florida’s Collier County have bagged more than 2,000 pounds of snakes and have found a 16 feet and 140-pound python. The newly found reptile sets a new state record for the largest male snake caught. Biologist Ian Bartoszek from the Conservancy of Southwest Florida and Paul Andreadis from Denison University have teamed up for the last three years to study python habits and catch never studied species. The team of researchers studying what they call “snitch snakes” were able to investigate the reptiles thanks to radio trackers on them. Giving the team the opportunity to study, Florida’s top predators in their daily habits. Pythons have become a great threat to Florida’s ecological landscape, most of them have ended up in the wild because pet owners release them or they were able to escape from breeding facilities. The outbreak has resulted in well-camouflaged reptiles hiding in leaves, everglades or roads. The Python outbreak has resulted in the wipeout of marsh rabbits in the Everglades, decreasing in deer and other ecological impacts across the state. Biologists assure that the reptiles can eat bigger up the food chain. The team of researchers have found the key hiding place of the reptiles that include armadillo burrows. With the investigation the team has become aware that pythons don’t mate in pairs. While tracking some “snitch snakes” down a gopher tortoise burrow the team pulled out a snake and found other seven snakes squeezed into the hole in what they called a “mating ball” since they found six males and only one female. This discovery led the team to understand that if they track one male snake they could find a pregnant female or other several male snakes. In the following of the snakes breeding season, the team understood that pregnant female snakes carry around 24 to 72 eggs so the catching of one can result in a lowering of the population. “It’s not like I’m waving a flag and declaring victory. But we’ve removed over 2,000 pounds of snakes from a fairly localized area, through active searching and radio telemetry, one little snake busted up multiple breeding aggregations” Said Florida’s investigator Ian Bartoszek. Other sides of the study include the understanding of the snake’s feeding habits, earlier research concluded that pythons were feeding small mammals including the prior mention marsh rabbits. The state has staged a python challenge that started in February inviting teams to find the reptiles, with more than 500 participants the price for more snakes found was $5,000 . The challenge helped citizens become more aware of the python invasion.